Do you need to announce new product line? Or wake up your customers to new product line? Then feel free to indulge with this custom rooster shape bottle opener keychain. It is made to perform as a bottle opener, keychain and amusement token. This rooster shape multifaceted token is best for promoting pet supplies, bird care clinics or services or for making new business announcements. It is made up of durable aluminum, which offers extra durability to your business messages. Chinese animal zodiac. 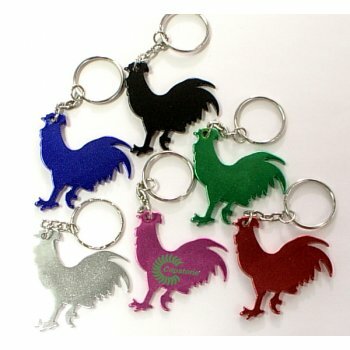 Request a quote to know price savings for bulk orders of this customized rooster shape bottle opener keychain. Features – Rooster shape aluminum bottle opener with split key ring and metallic finish. Available Colors - Metallic Black, Metallic Blue, Metallic Gold, Metallic Green, Metallic Purple, Metallic Red, Metallic Silver. Product Size : 2" x 2"